Famous landmarks shot "from the wrong direction"
Pictured here is the Taj Mahal as seen from the Taj Mahal, by photographer Oliver Curtis. Curtis spent years creating a photo set of famous landmarks as they have never been seen—literally! Brought up in the Cotswolds, Oliver began his photographic education studying photography at the renowned course at Filton Technical College in Bristol. He went on to study film and television at the London College of Printing and has been balancing work in stills and moving image ever since. His first solo exhibition entitled Volte-face will premier at London's Royal Geographical Society in September 2016. 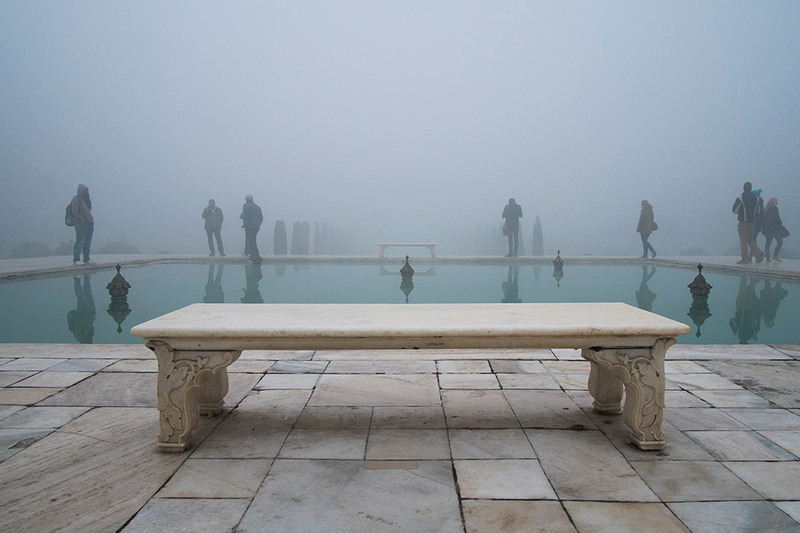 Taken over a period of four years, Volte-face is a series of images taken at the world’s most photographed historic sites, buildings and monuments - but looking away from them. To coincide with the exhibition at the RGS a book of the project, featuring an essay by Geoff Dyer, will be published by Dewi Lewis Publishing Ltd.